Biological threats: Dama gazelles do not need a lot of water, but they need more than other desert animals. They are not as resistant and perish from a lack of water during the drought season. The environment has become ill-suited for them. Habitat pressure from pastoral activity is another reason for decline, as are introduced diseases from livestock. Human threats: Another reason for the decline of this gazelle is habitat destruction. Humans cut down the branches of the trees on which these gazelles feed. As a result, the trees die and the gazelle cannot eat. A new threat the gazelle faces is tourism. Tourists want to take pictures of this endangered species, and in doing so, may be perceived as a threat, especially during the hot season. Gazelles will run away from perceived danger, and in the hot season may overheat and die of stress. 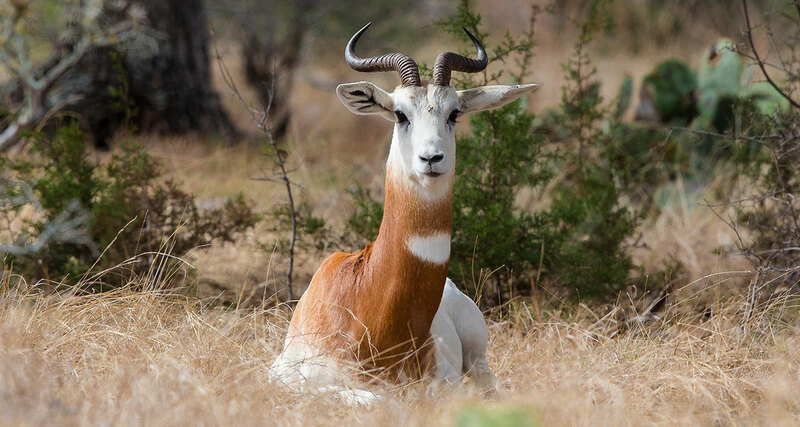 Relatively few actions have been taken in the conservation of the dama gazelle. The few measures that have been taken are reserves so the animal can live in peaceful environment and captive breeding to help rebuild the populations. A reserve for mhorr gazelles was set up in 1971 to help avoid extinction. This reserve, Parque de Rescate de la Fauna Sahariana (Rescue Park for Saharan Fauna) of the Estación Experimental de Zonas Áridas (Experimental Station of Arid Zones), is in Spain. The reserve has been a success and is still around today. Captive breeding is a very popular way to help an endangered species repopulate. The species reproduce in captivity, but the small founder population potentially presents a problem and may result in inbreeding. The primary focus of European EAZA zoos is the mhorr gazelle (N. d. mhorr), while the primary focus of North American AZA zoos is the addra gazelle (N. d. ru collis). Mhorr gazelles are also kept in North African facilities and both subspecies are kept in the Middle East. These are maintained as part of the European Endangered Species Programme and Species Survival Plan The studbooks include 293 mhorr (2014) and 168 addra gazelles (2012). One participant in the addra gazelle plan, White Oak Conservation in Yulee, Florida, has bred the gazelles since 1983, resulting in nearly 300 births. Several hundred additional animals that are not managed as part of the studbooks are kept privately, especially in Texas. Addra gazelles, part of the breeding program at the National Zoo in Washington, DC. Small population size and inbreeding are a serious concern in this population due to the increased parasite load and reduced reproductive viability. Few substantial in situ conservation efforts have been mounted due to the political situation in their currently fragmented habitat. The survival of this species in the wild depends on more reserves being created in the Sahelian and Saharan zones and better protection in the reserves that do exist. As the population deteriorates, researchers in 2008 stressed the need for healthy captive population and for help to preserve their habitats in the wild.